Grape seed extract with O.P.C, biovin, turmeric, wild rose hip, propolis concentrate and hawthorn berry, all organically grown. By combining these wonderful natural, herbal supplements, we provide a broad spectrum effect on all systems of the body, with the emphasis on antioxidant and anti-inflammatory effects. 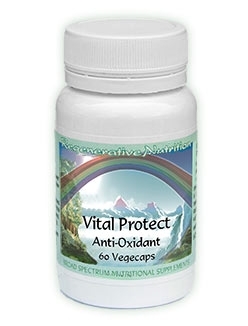 Long term protection is provided against the ravages of free-radical attack. The natural vitality of the body, (partly by enhancing the availability of electrons, a fundamental source of cell energy) is enhanced; truly a vital protection. Helps maintain energy, aids digestion, liver, circulation, anti-inflammatory. An extremely useful adjunct to the superfoods, such as Chlorella and Seagreens. Typical use: 3 capsules daily. To obtain the best from this health supplement, experiment to find the best quantity to suit you and omit use one day a week. High potency anti-oxidant with broad-spectrum action. Grape seed extract with O.P.C, biovin, turmeric, wild rose hip, propolis concentrate, Cayenne and Hawthorn berry, all organically grown. By combining these wonderful natural, herbal supplements, we provide a broad spectrum effect on all systems of the body, with the emphasis on antioxidant and anti-inflammatory effects. Long term protection is provided against the ravages of free-radical attack. The natural vitality of the body is enhanced (partly by enhancing the availability of electrons, a fundamental source of cell energy). Truly a vital protection. Helps maintain energy, liver, circulation, aids digestion and has anti-inflammatory properties. An extremely useful adjunct to superfoods such as Chlorella and Seagreens. Now there's another benefit to add to this remarkable list of benefits: it could prevent some of the top causes of blindness. Vision researchers at Washington University School of Medicine in St. Louis have documented that resveratrol stops out-of-control blood vessel growth (angiogenesis) in the eye. This discovery means resveratrol could preserve vision in three major blinding eye diseases: age-related macular degeneration (the leading cause of blindness in Americans over 50); diabetic retinopathy, which causes vision loss in about 20 percent of people with diabetes; and retinopathy of prematurity which occurs when premature babies experience an obstruction of blood flow into the retina -- a condition that blinds 50,000 infants each year. "A great deal of research has identified resveratrol as an anti-aging compound, and given our interest in age-related eye disease, we wanted to find out whether there was a link," Washington University retina specialist Rajendra S. Apte, MD, PhD, the study's senior investigator, said in a statement to the media. "There were reports on resveratrol's effects on blood vessels in other parts of the body, but there was no evidence that it had any effects within the eye." So Dr. Apte's research team decided to test resveratrol on mice that develop abnormal blood vessels in the retina after laser treatment. Their findings, published in the July issue of the American Journal of Pathology, showed that when the rodents were given resveratrol, the phytochemical prevented the growth of abnormal blood vessels. In fact, abnormal blood vessels that already existed actually began to disappear. When the scientists examined cells of the animals' blood vessels in the lab, they found a new pathway -- known as a eukaryotic elongation factor-2 kinase (eEF2) regulated pathway -- that is behind resveratrol's eye-protective power. "We have identified a novel pathway that could become a new target for therapies. And we believe the pathway may be involved both in age-related eye disease and in other diseases where angiogenesis plays a destructive role," Dr. Apte stated. "This could potentially be a preventive therapy in high-risk patients. And because it worked on existing, abnormal blood vessels in the animals, it may be a therapy that can be started after angiogenesis already is causing damage." Nutritional researchers and biologists agree that one of the main causes of aging and chronic health disorders is cellular damage caused by free radicals. This can be described as cellular changes associated with oxidative damage, akin to rusting, and associated with electron theft from cells. Many naturally protective chemicals (anti-oxidants) such as Vitamin C in herbs and foods help to prevent this damage. Not so well known, is that for the greatest potency and long term benefits, more complex naturally occurring plant chemicals and groups, are required. There is a story of a lone seaman who sailed round the world, with little access to fresh food who took 1,000 mg of vitamin C a day. After about a year, at the end of his trip, he was found to be suffering from scurvy. If he had eaten just half an orange a day, containing far less than 1,000 mgs vitamin C he would not have contracted scurvy. We know that simple vitamin C does not occur on its own in nature, but occurs with many other nutrients especially bioflavenoids and bioflavenols, that work with vitamin C to provide proper, sustainable health benefits and protection. Nutritionists are now beginning to realise that the best protection can be obtained from complex natural chemicals, in as complete a form as possible, and in combinations, e.g. from several food/herb sources. Professor Jack Masquelier made the first big breakthrough. He discovered a very potent antioxidant, which tests have shown to be 20 times more powerful than vitamin C and 50 times more powerful than vitamin E.
The extract has been available for about 15 years under the names 'Pycnogenel' (usually from pine bark) or OPC from grape seed and grape skins. Both these chemicals are the same, but a trademark dispute has created some confusion. The reality is that there is a special group of bioflavenols common in the skins and seeds of sun-ripened fruit and other plants, which Masquelier has identified as pycnogenols or oligomeric proanthocyanadins or OPC for short. It is present in red wine, but due to the widespread practice of picking unripened fruit to supply the shops, there is a widespread deficiency of this relatively common antioxidant. Apart from the extremely wide ranging potential health benefits OPC, it has specifically been found to strengthen capillary walls, and in its capacity as a smooth muscle relaxant, helps to relieve high blood pressure. Grape seed OPC produced using Masquelier's methods involved the use of chemical solvents acting on grape 'must' (primarily the skins and seeds). This resulted in an orange powder, with a relatively simple chemical profile, so that the specific chemicals Masquelier identified could be measured. Recently a more natural broader spectrum extract has been produced using ethanol (naturally occurring alcohol) and hot water to extract all the alcohol and water-soluble elements from the skins, seeds and leaves/stems of the grapes. This produces a deep purple powder smelling like red wine. It is a complex mixture of may protective factors and is a 5,000 to one concentrate from fresh grapes. The June 18, 2008 issue of The Journal of Neuroscience published the discovery of researchers at Mount Sinai School of Medicine in New York that administering grape seed polyphenols reduces amyloid beta aggregation in the brain and slows cognitive impairment in a mouse model of Alzheimer's disease. Accumulation of soluble high-molecular weight amyloid beta compounds in the brains of Alzheimer's disease patients leads to the formation of plaques that are believed to be responsible for the memory loss and dementia that occurs with the disease. For the current study, Giulio Pasinetti, MD, PhD, of Mount Sinai's Departments of Psychiatry and Neuroscience, and his associates used mice that were genetically modified to develop Alzheimer's disease. The animals were divided to receive a polyphenolic grape seed extract or a placebo for five months prior to the usual age at which signs of the disease develop. The dose of extract used in the study was equivalent to the daily amount of polyphenolics consumed by the average person. At the end of the treatment period, beta-amyloid accumulation was significantly reduced in the brains of animals that received the polyphenolic extract compared with the placebo group. The animals also demonstrated improved spatial memory compared with those that did not receive the extract, indicating less cognitive decline. In previous experimentation conducted by Dr Pasinetti, red wine was found to limit cognitive decline in the Alzheimer's disease mouse model. Research carried out by Dr Pasinetti's team has sought to identify the compounds in red wine's nearly 5,000 molecules that are responsible for its benefits. "Our intent is to develop a highly tolerable, nontoxic, orally available treatment for the prevention and treatment of Alzeheimer's dementia," Dr Pasinetti stated. Future research may determine whether grape polyphenols can be used to treat human Alzheimer's disease patients. Another potent, naturally occurring anti-oxidant is curcumin, contained in the spice Turmeric (also known as Indian saffron and yellow ginger). Turmeric has wide ranging health benefits. Curcuminoids have been described as nature's most powerful anti-oxidant, 150 times more potent than vitamin E and three times more potent than the pycnogenels/ OPC. Using the whole spice - a more sustainable and broad acting effect is achieved, its diverse health benefits have been appreciated throughout history, and modern, scientific research indicates that Turmeric can inhibit abnormal blood clotting, counteract some of the toxic effects from tobacco smoke, stimulate the flow of bile, strengthen the lining of the stomach wall, help prevent and treat peptic, duodenal and gastric ulcers, help to lower 'bad' cholesterol and reverse some types of liver damage. It can stimulate the production of essential liver enzymes and alleviate inflammation associated with arthritis. It has general anti-inflammatory effects said to be as potent than NSAIDs anti-inflammatory drugs. The traditional healing use of Turmeric includes the treatment of; indigestion, poor circulation, cough, amenorrhea, pharyngitis, skin disorders, diabetes, arthritis, anemia, wounds and bruises. An excellent natural antibiotic, strengthening digestion and helping to improve intestinal flora. Purifies the blood and stimulates the formation of blood cells. It promotes proper metabolism tending to correct both excesses and deficiencies. It can help to dissolve gallstones, whilst de-congesting the liver. Relieves menstrual pain. Traditionally used as a general tonic and known to be one of the richest sources of vitamin C, along with a wide spectrum of bioflavenoids. They have been used for general debility and exhaustion, and in the East are known as a chi tonic. Problems of constipation, liver, gall, bladder and kidneys may also be favorably influenced. If used as the whole fruit, i.e. the shells and the seeds, they contain a very wide spectrum of natural nutrition, and represent a traditional food/tonic form (hips/berries), missing from modern life. The nutritional profile provides a balanced source of antioxidant properties that will synergistically work well with other plant/food antioxidants. In China they have a traditional use in restoring kidney chi. Collected as a purple ripe fruit they contain a broad spectrum of anti-oxidants, including vitamin C complex, traditionally used as a heart and circulation tonic. They provide one of the best tonic remedies for the heart and circulatory system. They act in a normalising way on the heart, by either stimulating or depressing its activity, depending on need. In other words the heart will be moved to normal function in a gentle way. The property of herbs to normalise function either through stimulation or calming is indicative of the difference between the allopathic drug effect and the herbal one; using herbs and healing foods we provide the body with the chemical and energetic 'intelligence' to normalise itself, we are not forcing the body to do anything, against its 'will' i.e. homeostasis. As a long term treatment Hawthorn may be safely used for heart failure or weakness, palpitations, high or low blood pressure, arteriosclerosis and angina. However as with all fundamental health problems other nutrients are required (read Regeneration News for a fuller discussion of the broad spectrum nutritional approach, and Grapefruit Fibre - your Arteries' Best Friend) The use of a qualified health care practitioner is often appropriate. The thymus gland is a gland that helps to maintain a healthy immune system, from a traditional and energetic standpoint is related to the life essence. Dr. John Diamond, president of the National Academy of medicine, found propolis to be the best of all natural substances to strengthen the thymus gland, and hence build up the body's health reservoir and resistance to disease, also to possibly mitigate the effects of aging2. At the more mundane level propolis has the effect of helping to provide a balanced energy, has good antiseptic and anti-inflammatory effects, and is gentle on the system, i.e. has been used with a good degree of success in treating chronic fatigue and M.E. Propolis contains essential oils, bioflavenols of several different kinds and has antioxidant action. It exerts a stabilising and centering kind of energy, and as such tends to harmonise other remedies, herbs and superfoods it is mixed with. Has an affinity with the thymus, lungs and throat. Cayenne is an important herb with a wide sphere of action. It is the number one circulatory herb, being extremely effective and totally harmless. Has a total effect on the circulation - prevents stickiness of blood platelets, considerably reducing the tendency to clot and has a resolving action on existent thrombosis. This is all the more remarkable in view of the fact that it rapidly stops internal and external hemorrhage. The blood vessels are cleaned, making long term use or regular courses a rejuvenator of the circulation. Can have a wonderful effect on brain clarity and memory, especially of the elderly by its normalising effect on the circulation to that most vital organ! Any areas of the body that are deficient in blood supply, such as the brain, will receive fresh vitalising blood to renew and restore. In this respect it helps to transport other ingredients in a herbal/functional food formulae, to areas of previously poor circulation giving the other ingredients extra penetration. High blood pressure will tend to be reduced and low blood pressure raised.